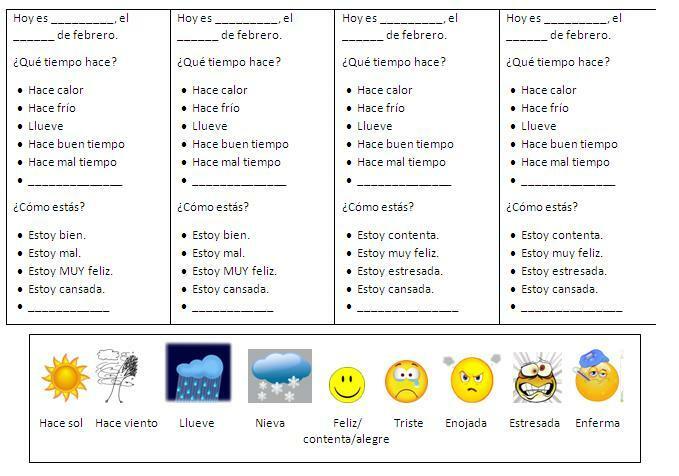 My primary goal is to get continual reinforcement of weather and feelings words, and encourage a variety of responses to ¿Cómo estás? I left a blank so they can personalize their responses, but included the choices to get them to keep reading over them to choose the appropriate responses for each. It has also worked as a good review of days of the week. It’s a quick routine at the beginning of class, I’m speaking comprehensible language, and my students are giving me a variety of personalized responses. If you want a copy, here are the Dropbox links, gender-specific so my girls will stop saying Estoy cansado! This entry was posted in Class Activities, Sp 1: Weather and tagged feelings, warm ups, weather. Bookmark the permalink.